This free Mac MPEG video converter is supported by multi-core CPU utility and high quality engine, which offer users a fast and high quality experience to convert video to MPEG and convert video to MP4. You can also flexibly set the video and audio parameters manually for your personal requirement, including audio quality, audio sample rate, video quality and video frame rate. 1. 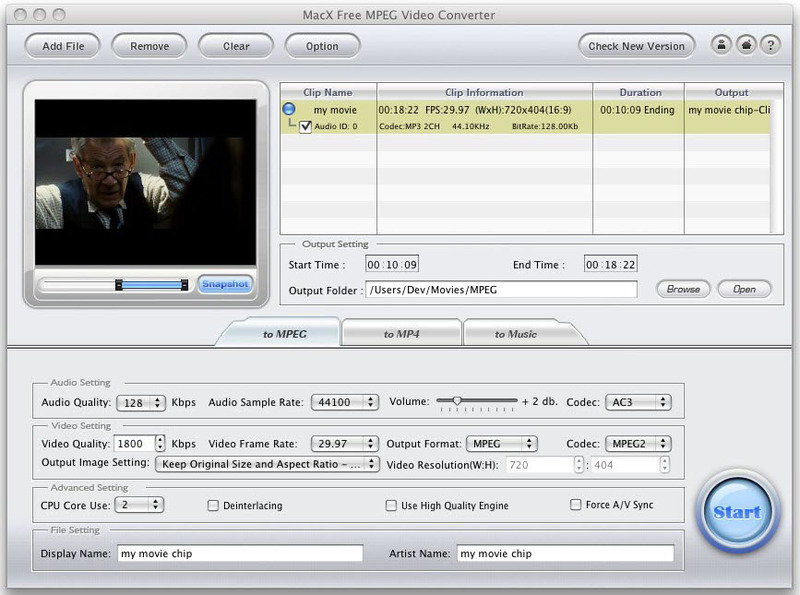 This Mac free MPEG converter can free convert any HD and SD videos to MPEG format with high quality. 2. Extract MP3 audio from video, letting users play their favorite music conveniently or use it as ringtone. 3. Supported by multi-core CPU utility and advanced “Safe Mode” function, the process of free converting video to MPEG and MP4 can be finished fast and smoothly. 4. The in-built High Quality Engine and De-interlacing feature guarantee high video and audio quality. 5. This free MPEG converter for Mac enables users to take screenshots from video to save as JPEG, BMP pictures for Mac, so as to share with friends or take them as wallpapers. 6. Users are also allowed to freely adjust the video and audio parameters like video bitrates, video resolution, frame rate, audio volume etc to control output effect. 7. Totally free and 100% clean, easy to use. No watermark, no time limit and no functions or features reversed. 8. Improved the speed of MPEG encoding and decoding and modified video and audio out-of-sync problem after conversion. Improved the speed of MPEG encoding and decoding.